Writing has been my escape and a way to vent out my feelings since childhood. I used to maintain a diary as a kid and a teenager. It was easier to express feelings to a diary than to actual people. It wasn’t judgmental and also listened carefully to what I had to say. Gradually the casual rants converted to poems and stories. But sometimes, I’m not able to collect all my thoughts and put them down on a paper in the form of words. After I joined my job, I had a lot to say, but not enough internet access and time. When I got the internet access, I started suffering from a writer’s block and then somewhere in between, I started feeling like I wasn’t good at it. I was suffering from inferiority complex for some reason. I just couldn’t write. It was foolish and painful! I used to go to my blog, start a post, write a few lines, delete them, rephrase them, save the draft and log out. “I’ll finish it later”, I’d think. “Or maybe not. Who would want to read it anyway?”. Things went on like this. One and a half years passed, with no new post on the blog. “I’d write something tomorrow”, but the tomorrow never came. Every form of art attracts me, may it be dancing, singing, writing or sketching or anything else. I used to sketch, draw and paint a lot as a kid. But that faded away with the lack of time to devote. But I did follow a lot of artists on Facebook and Instagram. One fine day, I discovered that those doodles we all used to make on the back pages of our notebooks have found their place in the art world too! I found that there’s a whole world dedicated to them, with different categories too. So on a whim I decided to start doodling. I bought a set of pen on Amazon and a drawing book from the store near my PG. I did not know where to start! It wasn’t a masterpiece. But for sometime, it became my favorite piece of art of all times! because I created it myself (Yes I am a narcissist). At first I had no idea of what to make. I took inspiration from what I saw on Pinterest and Google and to my surprise people were actually liked my amateur attempt! My confidence grew with time and I decided to try my hands on sketching too. I was sketching after a long time and I was scared. I Googled a few portraits and found one of a lady and thought of giving it a try. I wasn’t a very big fan of how the original one looked so I made some changes in the eyes, nose, lips and eyebrows and I personally feel it turned out good. I have never been very good (and confident) at drawing people but that cannot stop me from trying, right? I’m quite comfortable with experimenting now but still do some research before making anything. I still have to work a lot on my self confidence. “How do you do it?”, People ask me. There’s nothing very typical about it. Really! It’s as easy as art can get. And therapeutic too. Just find some inspiration. I feel everyone should try. It calms my mind, gives me a feeling of satisfaction and makes me happy. You can be an artist too! All you need is a pen, a paper, a little imagination and some concentration (you’ll even build it along the way) and you are good to go. Next Post क्यूँ डरते हो? 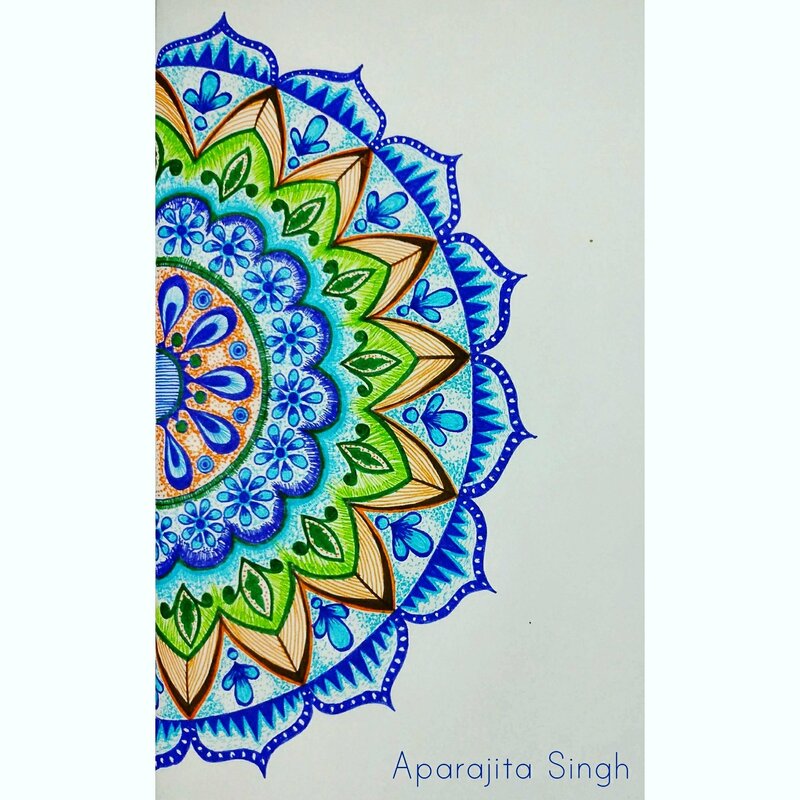 Oh my, Aprajitha you are so talented. Amazing pieces of doodling. My daughter also sketches and doodles. And she too says” art is therapeutic”! So true! And it is so therapeutic as well. In my opinion, everyone should try to find their artistic side.